White paper on crime 2004 Part1/Chapter2/Section5/2. Table 1-2-5-3 shows(a)the number of suspects who were not prosecuted by public prosecutors on the grounds of being insane or quasi-insane,(b)the number of persons who were found not-guilty on the grounds of being insane or given a mitigated sentence on the grounds of being quasi-insane in the ordinary first instance,over the last10years from1994to2003,and(c)dispositions in2003by type of offense and type of mental disability.In2003,among the693insane and quasi-insane persons,406were involuntarily admitted to mental hospitals,and47were sentenced to imprisonment without suspension of execution of sentence or taken into custody(see Appendix1-11 ). 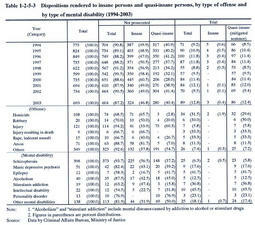 Among the 324 suspects who were not prosecuted on the ground of being insane in2003,homicide had the largest share(71persons),followed by arson(58persons)and injury(41persons)in type of offense,and schizophrenia had the largest share(225persons)in type of mental disability.Among the280suspects who were not prosecuted for being quasi-insane,injury had the largest share(73persons)in type of offense,and schizophrenia had the largest share(148persons),followed by manic-depressive psychosis(20persons)in type of mental disability. Among the 86 convicts who were given a mitigated sentence on the ground of being quasi-insane persons in the first instance in2003,homicide had the largest share(32persons)in type of offense,and schizophrenia had the largest share(23persons)in type of mental disability.